P S Verma & V K Aggarwal (biology) Solutions for Class 9 Science Chapter 3 Tissues are provided here with simple step-by-step explanations. These solutions for Tissues are extremely popular among class 9 students for Science Tissues Solutions come handy for quickly completing your homework and preparing for exams. All questions and answers from the P S Verma & V K Aggarwal (biology) Book of class 9 Science Chapter 3 are provided here for you for free. You will also love the ad-free experience on Meritnation’s P S Verma & V K Aggarwal (biology) Solutions. All P S Verma & V K Aggarwal (biology) Solutions for class 9 Science are prepared by experts and are 100% accurate. (i) They divide the work labour in multicellular organisms. (ii) They get organised to form different organs and organ systems. (iii) They provide a higher efficiency to multicellular organisms by improving their organisation. Plants and animals are different kinds of organisms; hence, they require different types of tissues to carry out their bodily functions. Plants are autotrophic and stationary, whereas animals have to move from one place to another in search of food, mate, and shelter. Plant tissues are suited for the stationary habit of plants, whereas tissue organisation in animals is targeted at providing higher mobility. Dead supportive tissues are more abundant than living tissues in plants. Living tissues are more than dead tissues. Less energy maintenance is required. More energy maintenance is required. Plants grow throughout their life due to meristematic tissues. Animals do not grow after reaching maturity. There is only reparative growth. Tissue organisation is meant for stationary habits. Tissue organisation is meant for high mobility. Intercalary meristems are located at the base of leaves or internode and below the nodes. These type of meristems are involved in increasing the length of an plant organs such as leaves and internodes. Examples: Stems of grasses (meristems are located at the base of leaves) and mint (meristems are located below the nodes). (a) Apical meristems: They are responsible for root and stem elongation, resulting in an increase in the height of the plant (primary growth). (b) Lateral meristems: They cause an increase in the diameter and girth of stems or roots (secondary growth). Simple tissues consist of cells that are structurally and functionally similar. They are made up of only one type of cells. (a) Parenchyma: It forms the bulk of the plant body. The main function of parenchyma is to store and assimilate food. (b) Collenchyma: It is located below the epidermis of dicotyledonous stem and petiole. It provides mechanical support to the plant body. (c) Sclerenchyma: It consists of dead cells. It provides mechanical support and protection to the plant. (i) It provides mechanical support and elasticity in young dicotyledonous stems. (ii) They manufacture sugar and starch if their cells possess chloroplast. (b) sclereids (grit cells or stone cells). The main function of sclerenchyma is to provide mechanical support and protection to the plant. It conducts water and minerals. It conducts organic solutes or food materials. Conduction is unidirectional (from roots to apical parts). Conduction is bidirectional. 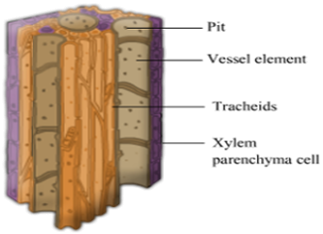 Conducting cells of xylem are tracheids and vessels. 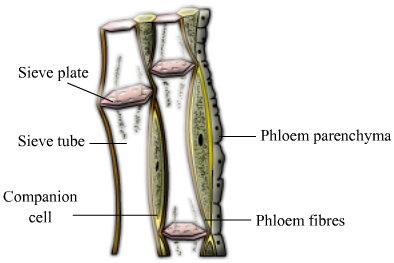 Conducting cells of phloem are sieve tubes. It provides mechanical strength to the plants. It has no mechanical function in the plants. Except xylem parenchyma, it is composed of dead cells. Except phloem fibres, it is composed of living cells. They are single celled. They are made up of row of cells. The end walls remain intact. The end walls get dissolved and become perforated. Its walls are very thick with a narrow lumen. Its walls are less thick with a wider lumen. (i) Sieve tubes: These are slender, tube-like structures composed of elongated thin walls placed end to end. Their end walls, sieve plate, are perforated by large number of pores. Sieve tube elements lack nuclei, but they remain alive via adjacent companion cells. (ii) Companion cells: They are connected with the sieve tubes via plasmodesmata. They are thin-walled cells consisting of dense and active cytoplasm and large, elongated nucleus. 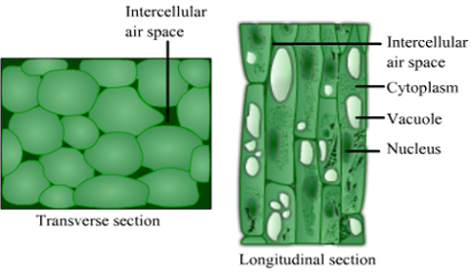 (iii) Phloem parenchyma: As the name suggest, they consist of living parenchyma cells. They are involved in storage and lateral conduction of food. (iv) Phloem fibres or bast fibres: These are dead cells of phloem possessing a narrow lumen. They are meant for providing mechanical support to the phloem. (i) Vessels: These are long tube-like structures that are formed by a row of cells placed end to end. The transverse walls between the vessel elements are completely dissolved forming water pipes. 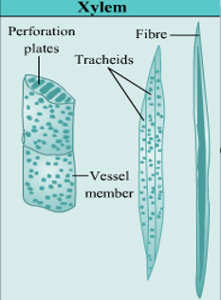 (ii) Tracheids: These are elongated cells with tapering ends. Since their end walls have closed ends, water has to pass from cell to cell via pits. Both these elements are involved in the conduction of water. (i) The main function of parenchyma is to store and assimilate food. Hence, they are referred to as food storage tissues. (ii) It serves as a packing tissue to fill the spaces between other tissues and maintain the shape and firmness of the plant. (iii) It stores waste products of plants. (i) It is a mechanical tissue and provides mechanical support and elasticity to the stems of dicot plants. (ii) If its cells possess chloroplast, then it is involved in manufacturing sugar and starch. (iii) It provides tensile strength and flexibility to the plant body. (i) It provides mechanical strength to the plant. (ii) It is involved in providing protection and strength to the plant body. (iii) It makes the plant body rigid, flexible, and elastic. It consists of thin-walled living cells. In collenchyma, cells are thickened at a localised regions. It is distributed in almost all the parts of the plant. It is mostly present in the aerial parts of the plant. They are involved in food storage. They are the chief mechanical tissue in young plants, particularly dicot stems. It consists of living cells. It consists of dead cells. Cell wall thickenings are not uniform. Cell wall thickenings are uniform. Its cell walls are cellulosic. Its cell walls are lignified. Its cells possess cytoplasm. Its cells lacks cytoplasm. It provides mechanical support and elasticity to the plant body. It is mainly a mechanical tissue. (i) To carry water and mineral salts upwards from the root to different parts of shoots. (ii) To provide mechanical support to the plant as the walls of tracheids, vessels, and fibres of xylem are lignified. (i) It is the chief tissue that conducts photosynthetically prepared food materials from the leaves to the storage organs and later from storage organs to the growing regions of the plant body. (ii) Phloem fibres or bast fibres of some plants such as jute, hemp, and flax have commercial or economic value. It is further subdivided into apical, lateral, and intercalary meristems. (ii) Permanent tissue: They are of two types. (a) Simple permanent tissues include parenchyma, collenchyma, and sclerenchyma. (b) Complex permanent tissues include xylem and phloem. Sieve tube elements of phloem tissue lack nucleus but still they manage to live. This is because they are connected to the companion cells of phloem tissue via numerous plasmodesmata. Both sieve tube elements and companion cells develop from the same meristematic cell and form a functional unit. Companion cells provide proteins, ATP, and other signalling molecules to the sieve tube member as it contains extra number of mitochondria and chromosomes. (i) It protects the underlying parts of body from mechanical injury, entry of germs and chemicals, and drying by lining cavities of mouth, oesophagus, nose, and blood vessels. (ii) It helps in excretion (in kidney tubules). (iii) It helps in absorption (in stomach and intestine). (iv) It helps in different body secretion (mucus by goblet cells in various parts of the body). (i) Striated muscles: They are located in the limbs, body wall, face, neck, etc. They also form in tongue, pharynx, diaphragm, and upper part of oesophagus as visceral striated muscles. (ii) Smooth muscles: They are found in the walls of the hollow visceral organs except in heart and are called as visceral muscles. They form in alimentary canal, ducts of glands, urogenital ducts, blood vessels, bronchi, iris of eye, etc. (iii) Cardiac muscles: They are located in the walls of the heart. Neuron and dendrite are found in nervous tissue. Cilia is found in ciliated epithelial tissue. Collagen fibres and elastin fibres are found in loose, connective tissue. (a) Osteoblast or bone cells are involved in the process of bone formation. (b) Chondroblast produces and maintains the matrix of cartilage. (c) Goblet cells perform the function of secreting mucus in the body. 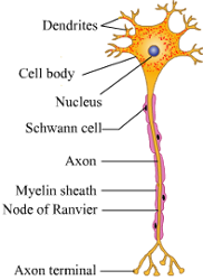 (d) Neuron conducts impulses to different parts of the body. 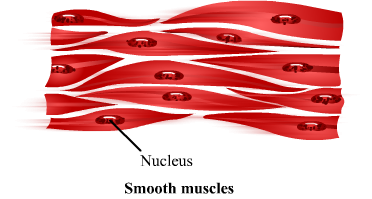 (e) Muscle cells are responsible for bringing about the movement of body or limbs by contraction and relaxation of contractile proteins that are present in them. (i) It consists of three parts—that is, cyton or cell body, dendron, and axon. All the three parts are further composed of many subparts. (ii) Nerve cell is involved in transmitting or conducting the impulses (signals) to different parts of the body. Bone provides shape and skeletal support to the body. It also protects the vital body organs and serves as a storage site of calcium and phosphate. Cartilage provides support and flexibility to the body parts and smoothens the surface at joints. Ligament strengthens the joint and permits normal movement and prevents over-flexing and over-extension. (a) Adipose tissue stores fat. (b) Squamous epithelium lines lung alveoli. (i) It transports nutrients, hormones, and vitamins to the tissues and excretory products from tissues to the liver and kidney. (ii) RBCs carry oxygen to the tissues for oxidation of food. (iii) WBCs destroy the pathogens that enter our body. (iv) Blood platelets disintegrate at the site of injury and help in blood clotting. 1. Epithelial tissue: It is further subdivided into squamous, cuboidal, columnar, and ciliated epithelial tissue. 2. Muscular tissue: It has three subtypes—that is, striated, smooth, and cardiac muscles. 3. Connective tissue: It has four subdivisions—that is, areolar, adipose, skeletal, and fluid connective tissue. 4. Nervous tissue: It is composed of nerve cells.